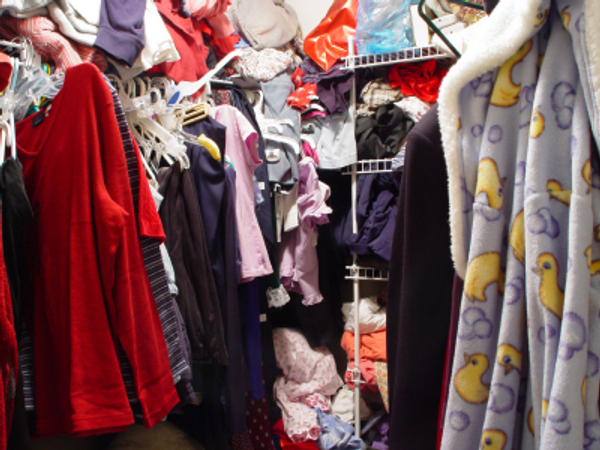 Do you often feel like you have nothing to wear even though your closet is full of clothes? 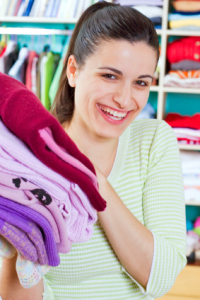 Clean up your wardrobe and stay organized by cleaning out your closet every three months. Though many women dread the thought of throwing out some of their clothes, you will be better off once you get organized. You need to figure out which clothing items to keep and which to get rid of from your wardrobe. If you do this right, you will soon have plenty of room in your closet and getting dressed will be much easier! To start off, set aside the clothes that you wear regularly. These are clothes that are you are obviously keeping. In the video below from Video Jug, they suggest separating the rest of your clothes into the following piles. These clothes are in good condition, but you don’t wear them for one reason or another. Maybe those jeans don’t fit anymore, or maybe you figured out fuchsia isn’t your color. These clothes are still worth something. Therefore, you should sell them locally at a consignment shop or online at eBay. Use the money you make to buy something new that you will wear! These clothes are so embarrassing that you shouldn’t even own them. No one will pay a dime for them. Therefore, you should load this pile into your car and drop them off at your nearest thrift store, Goodwill or Salvation Army location. Get a receipt for your donation for tax purposes! These are clothes that are a little damaged but worth saving. If you just need to hem your designer dress or replace a zipper in your favorite skirt, then they are worth keeping. As soon as you are done sorting through your entire closet, take these clothes to the tailor immediately, so you won’t forget. A good rule is if you haven’t worn an item in a year, get rid of it. However, if you have some clothes that you are on the fence about, keep them around for another three months. However instead of letting these questionable items crowd your closet, move them to a storage bin. Place the bin in the back of your closet or under the bed. Next time you clean out your closet, go through the bin and decide if it’s time to part ways with these items. Once you have gotten rid of everything you don’t want or need, organize the clothes you do wear. Hang everything where it belongs and sort your items by color to make getting dressed a snap. Also, don’t forget about your shoes. Sort them into the same piles and act accordingly. Remember to repeat this routine every three months. Mark it on the calendar or just remember that every time the season changes, you need to clean out your closet!